Andrew Bovitz, born Jan. 13,1919, Chisholm, MN. 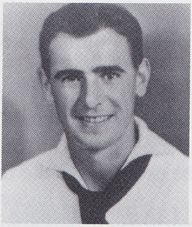 He enlisted in the USN at Evelth, MN, Sept. 10, 1940; trained at Great Lakes NTC before being assigned to the FC Div. of the USS West Virginia berthed at Bremerton, WA, in November 1940. He was aboard the ship on Dec. 7, 1941. Three days after abandoning ship, he returned aboard as security watch for eight hours a day for the next three weeks. Served on the USS Pruitt (DM-22) from January 1942-October 1944. He was admitted to the USNH, Oakland, CA, with a chest condition and was discharged with a service connected disability on Jan. 13,1945. He received four medals. Bovitz graduated from Albany Business College, Albany, NY. He was a purchasing agent for Watervliet Arsenal, Watervliet, NY, retiring on Jan. 10, 1979. He and his wife Anne have two daughters and one grandson.